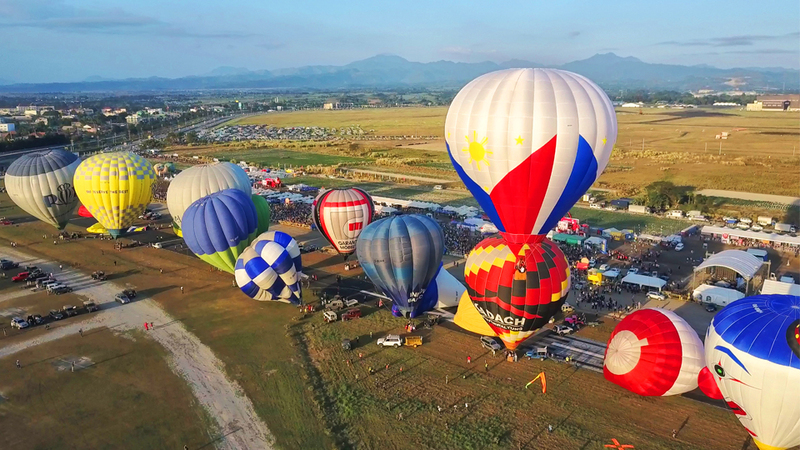 One of the most anticipated events in San Fernando Pampanga is the hot air balloon festival 2019. While this yearly event has been canceled this year due to the lack of government commitment, there might be other aerial shows and events that could potentially happen outside Clark, Pampanga. As of this writing, the plan to host another aerial event might be a tenuous one but nonetheless, as we get more updates, we can certainly be hyped out about the event. You can read about the Hot Air Balloon Fiesta 2019’s cancellation here. The early bird catches the worm but in this case, the early attendee gets the best spot and can avoid long queues. Of course, queues are inevitable occurrences you would have to put up with—particularly for events as big as this one. However, you can mitigate the possibility of waiting too long to get in if you arrived as early as possible in the venue. Typically, the event starts as early as 6 AM so from there, you can gauge as to what time you wish to arrive. Buy your tickets in advance and arrive hours before the event is scheduled to open (you can already find a long queue by 3 AM). Gates open around 5 AM. While the weather in February can be unpredictable, it is best to come prepared. Considering that this is going to be a whole day event, it is best if you are adequately prepared for what the weather might bring. Monitoring the weather forecast for the date of the event will be useful in helping you determine which things to bring. Typically, on a scorching February day, you would need some protection from the sun. As the event is held in open fields, there are no shady shelters for which you can take refuge from the scourging heat of the February heat. In this regard, it is best if you brought your own tents with you. Organizers have allowed attendees to bring their own tents and food to the venue. If you intend to stay the entire day, expect it to get hot which would constrain you to find a place to stay under the heat. If you are not averse to walking around under the scorching heat just to take aesthetic aerial shots, you can opt to bring and apply sunblock as well. Of course, capturing the colorful sky and picturesque moments are two of the things that compelled us to buy tickets. In this regard, most of us would want to immortalize the experience by taking photos. While you are within your rights to bring your cameras regardless of how small or big they are, drones are explicitly not allowed. This is to ensure that none of them collides with any of the aerial apparatuses or hot air balloons. Similarly, avoid bringing any remote-controlled aircraft and hoverboards to the event. Typically, attendees buy tickets with the thought that they are to see hot air balloons in the sky solely. However, this event is so much more than seeing a myriad of hot-air balloons in various shapes and colors color the sky. The event has other fun activities where attendees are encouraged to participate. Apart from the hot-air balloon flights, attendees can also see other exhibits and booths which are organized by the Philippine Air Force as well as students from Aviation schools. In fact, paragliding, search and rescue flight demonstration, skydiving, car exhibitions are a slew of the activities you can witness on this event. If you wish to participate yourself, you can try your hand at kite flying, horseback riding, archery and so much more. Keep in mind that the event is likely to last the entire day and if you wish to take full advantage of what you have paid for the ticket then you need to be awake to witness the event in its entirety. With this in mind, get enough sleep so that you would be able to enjoy the event thoroughly.